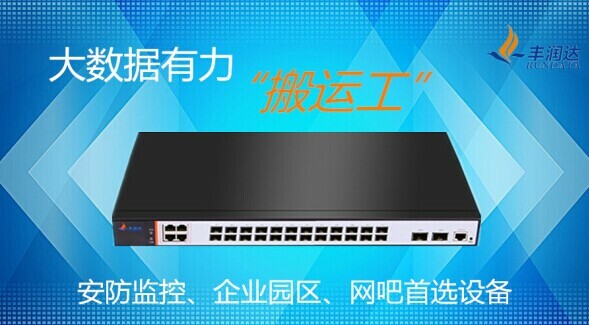 With the development of computer network, the requirement of network connection and data exchange is getting higher, speed and intelligence have become an important indicator to measure the network performance of Ethernet switch. Requiring not only a 10 Gigabit transmission rate, to meet the rapid growth of bandwidth, but also the devices which can be samrt management, support a variety of smart business, as well as improve the security control strategy. 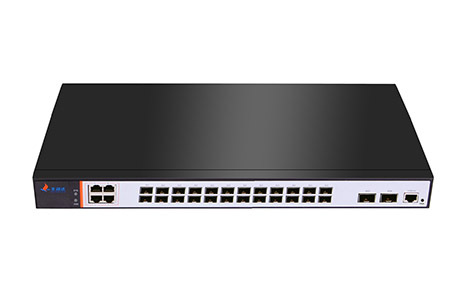 DF5700-24TF-4G-2QF is Rundata independently developed high performance converged Ethernet switch products, based on the industry's leading high performance hardware architecture and Rundata advanced RUNOS system, with advanced hardware processing capability and rich business characteristics. It supports up to 24 10 gigabit ports, to achieve the industry's 1U equipment highest 10 gigabit ports density and flexible ports expansion capacity. With excellent Broadcom switch chip, providing a powerful store-and-forward switching function and processing capacity, the packet forwarding rate is 482Mpps, the bandwidth is up to 650Gbps. With a wealth of business characteristics, support IRF2 (intelligent flexible architecture) technology, widely used in enterprise network and campus network access. For large data center blocking traffic data transmission requirements, the device can provides strong cache capacity, and supports advanced cache scheduling mechanism, can guarantee to maximize the efficient utilization of buffer capacity of equipment. Using the industry-leading Broadcom 10 gigabit switch chip solution, stable and reliable, to ensure that all ports data forwarding without blocking. The use of Carrier-class switching power supply, with lightning protection, overvoltage protection, anti surge design, voltage adaptive 110-240 wide range, to ensure the normal operation in bad weather and unstable voltage environment. Component are world-class high-frequency low-impedance devices, high conversion efficiency, small heating, natural and no fault duration is much higher than the industry of the same type of products. Support port loop detection and loop to avoidance, user port IP+MAC address authentication, can defend the network ARP attacks and DoS attacks. Support storm control function, suppression of broadcast, multicast, unicast and other storm. Support full duplex and half duplex mode under the IEEE 802.3x flow control function, ensuring the stability of the large flow data exchange, and network paralysis would not caused by excessive burden. It supports centralized MAC address authentication, 802.1x authentication, portal authentication, user account, IP, MAC, VLAN, port support such as user identity elements bound statically or dynamically, and realize user strategy (VLAN, QoS, ACL) data release. With the support of Rundata’s RUNOS system online user real-time management, diagnosis and collapse of network illegal behavior in time. With the equipment level and link level of multiple protection reliability, using over current protection, over-voltage protection and overheat protection, support the STP, RSTP, MSTP multiple generation tree protocol, rapid convergence and improve the ability of fault tolerance to ensure the stable operation of the network and link load balancing, reasonable using of network channel, raising the utilization rate of the redundant link. Support ping, telnet, trace, SSH and other network diagnosis, so that the device has a high reliability. Supporting rich link level reliability technology, such as unique ERPS ring network protection mechanism from Rundata, even when the network carrying multi service and large flow, it does not affect the convergence time and ensure the normal development of the business. Excellent anti attack strategy, support ARP binding, support the protection of CPU, limiting the rate of sending CPU messages, avoid illegal attacks on CPU attacks and resource consumption. 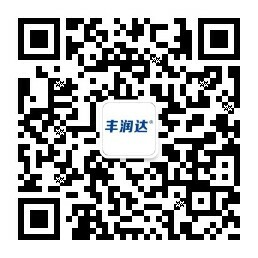 Support innovative IRF2 Intelligent Resilient Framework technology, make the product have market advantage. Scalability, the use of interconnected cables can realize more than one device expansion, plug and play, a single IP management, greatly reduce the cost of system expansion. Reliability, through the patented route hot backup technology to enhance the reliability and high performance of the IRF group, while eliminating the single point failure, avoiding the business interruption. Distributability, through the distributed link aggregation technology to realize the load sharing and mutual backup of multiple links, so as to improve the redundancy of the whole network architecture and the utilization of link resources. Usability, through standard 10 Gigabit Ethernet interface to achieve intelligent resilient framework, can according to the demand assigned bandwidth and system link bandwidth, and the rational distribution of the local flow and upstream flow; Can not only achieve frame, cross frame, and even cross region remote intelligent resilient framework. Provide source MAC, destination MAC, based on the source IP address, destination IP address, L4 port number, protocol type, VLAN flow classification. Provide a flexible scheduling algorithm for scheduling, can be based on the port and queue settings, support SP, WRR, DRR and other scheduling strategies. Support based on 802.1p (COS) classification, CAR traffic speed limit function. Support in the direction of the port mirroring, for the specified port on the packet monitoring, data packets on the port will be copied to the monitoring port, in order to carry out network testing and troubleshooting. Support rich management interface, such as Console, with external orifice, support SNMPv1/v2/v3. Support CLI serial command line, Web, Ping, Telnet, Trace, etc., so that the device management is more convenient; support LLDP, PDP agreement, and SSH2.0 encryption methods, making the management more secure. Support Netstream message statistics and SPAN/RSPAN/ERSPAN mirror and multiple mirroring observation ports, can take appropriate management measures through analysis the network traffic, make originally invisible network service application flow become clear at a glance, providing network flow analysis reports to help the users optimize the network structure, adjust the resource deployment timely. Providing a simple visual Web interface, convenient operation to the various functions of the device. Supporting Reset a key to restore the factory settings, to support the ring network detection, to provide innovative network diagnostic function. DF5700-24TF-4G-2QF provides 24 10 Gigabit uplink port, 4 Gigabit downstream ports, 2 40g QSFP ports, providing diverse access function, and well adapted to the changing application environment, meeting voice, video and data networks a triple-play gamma bandwidth. 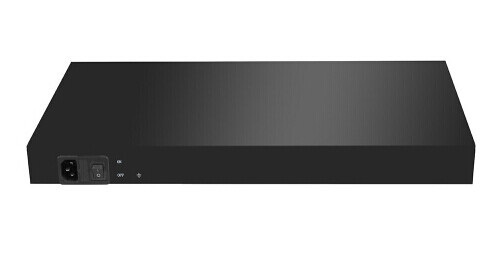 DF5700-24TF-4G-2QF can be used in the core layer of HD monitor network, the whole system uses PoE switch power supply, eliminating power wiring trouble. 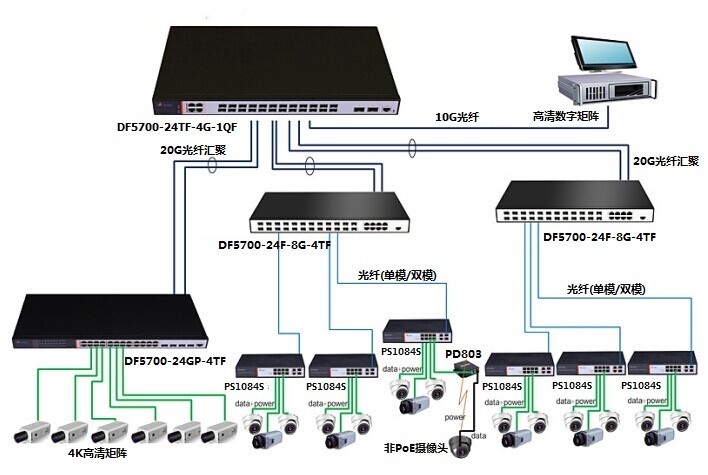 Using 24 optical ports switch from Rundata transmit front-end collected video data, through fiber aggregation to the core switch. 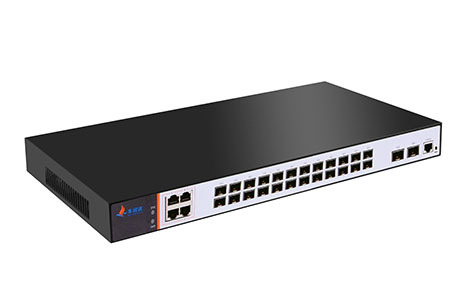 In the new era of 10 Gigabit security, the traditional Ethernet switch to simply realize the connection and data transmission function has become the past, throughout the whole development trend, Ethernet switch is moving in the high-speed, intelligent direction. Rundata DF5700-24TF-4G-2QF can calmly deal with the era of big data provide high capacity, easy to satisfy data center expansion, reliability, management and security challenges, will be indispensable in the 10 Gigabit switch market.